If you wanna be happy for the rest of your life…there is a science to follow. One of the recommendations from this emerging science is that you prioritize experiences over acquisition of material things. The philosophy being that no matter how badly you want some thing, once you have it, you will want something else. Alternatively, if you live your life acquiring memories and experiences they will sustain you for long periods. Does this ring true for you? Of course, there are other suggestions to invite happy living. Obvious ones are eating well, exercising, spending time with loved ones and enjoying nature. Less obvious are things like making time for creative expression and setting and achieving challenging goals. The Happiness Frog is the beginning of a new series that unites the science of happiness and positive psychology with yarn bombing; hence the Optimizehappiness hashtag. So, stay tuned for more and in the mean time be sure to let us know what makes you ‘hoppy’-maybe we can conspire on the next project together! 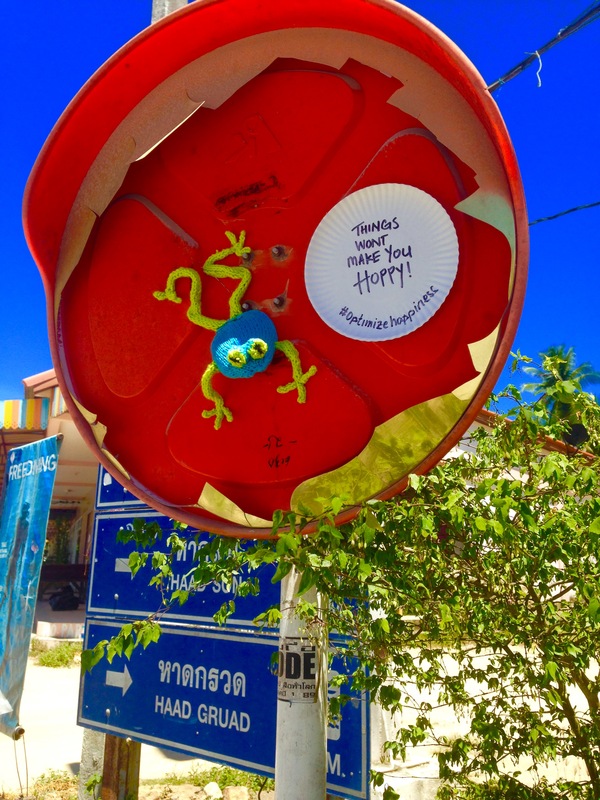 This frog was installed on June 11, 2016-International Yarn Bomb Day- on Koh Phangan island in Thailand. It is, as per usual these days, stuffed with plastic bags and secured with glue on a disused street sign.